Understanding Animal Research has worked with four institutions, MRC Harwell, The Pirbright Institute, the University of Bristol and the University of Oxford, to create a virtual ‘street view’ tour of their laboratories. Go to labanimaltour.org to view the tours for yourself. Visitors are provided with maps of the four facilities, with viewable rooms labeled. The University of Bristol’s research facilities allow human and veterinary surgeons to work side by side on medical research that will benefit man and animals. The MRC Harwell Institute has thousands of mice strains to investigate what genes do and the relationship between genes and disease. The University of Oxford’s primate centre conducts research into how our brains work, and The Pirbright Institute creates vaccines that protect livestock from diseases such as foot-and-mouth and swine flu. Inside the room, the tour provides videos of researchers and technicians explaining more about how and why animal research is conducted. Viewers can turn and look around, find more information about things that they see, and watch videos which explain more about the research. 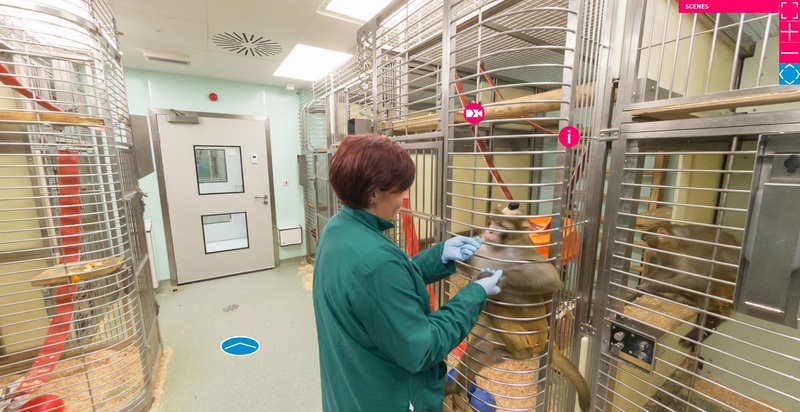 Using labanimaltour.org you can look round primate rooms in the University of Oxford. It also includes videos explaining how and why the primates are used in research. The Concordat on Openness on Animals Research, signed by all four institutions, was launched in 2014, and this virtual lab tour marks another success on its third anniversary. Other British institutions have also expressed interest in creating their own 360 lab tour. This launch comes days after Americans for Medical Progress launched their own openness initiative, “Come See Our World“, to show the public accurate images from the lab. The last few years have seen a wealth of new ideas on proactively explaining what goes on in animal labs. It is essential such initiatives continue if the research community is to convince the public that such research is done humanely, under strict regulations, for the benefits of society. Posted on June 14, 2017 June 14, 2017 by EditorPosted in News, Outreach NewsTagged Lab Animal Tour, LabAnimalTour, MRC Harwell, Pirbright Institute, understanding animal research, University of Bristol, University of Oxford, virtual lab.